Fill in the analogy: Chablis is to oysters as pilsner is to _____? Stumped? You’re not alone. While food and wine pairings are all but canonical, time-tested and true, most of us are less confident pairing brews. If you think about it, it’s a surprising gap. Beer is ancient, enjoyed as much today as by the Babylonians. Moreover, the minds of the brewer and the chef are similar. Both spend hours in pursuit of flavor, tweaking recipes to render the perfect glass or plate. Each reveres seasonality, ingredients and techniques chosen to reflect time and place. It’s focused work, a labor of passion and attentiveness. Too often, though, the kitchen and the brewhouse never meet. One food-centric brewery, however, has set out to change all that. It’s the natural evolution of a brewery that has always set a high bar for flavor. When John and Chris Trogner were shaping up their business plan in the mid-90s, their impulse was to open a brewpub. John would handle the brewhouse, having perfected the art of craft brewing out in beer-drenched Colorado. Chris would run the restaurant. “Everything we were designing was around food and beer,” explains John Trogner. When the time came to move home to Harrisburg and launch, however, it was decision time. “Pretty quickly, we realized: ‘Wow. Those are two really challenging businesses.’” With their inaugural pint of pale ale sold in July 1997, Tröegs Independent Brewing was born. Fast-forward 10 years, and with an expanding distribution footprint covering 11 states, the brewery had fully outgrown those Harrisburg digs. A new space in Hershey opened with shiny brewhouse equipment, a killer cellar for their splinter beers, expanded production capacity and more space and bandwidth for tours. That’s when the brothers noticed something. “When we opened up and people started coming, they weren’t the same customers,” Trogner says. “Before, it was really in-tune beer geeks who wanted to try an eclectic beer. Here, all of the sudden we had families coming in.” While watching mom and dad drink high-gravity brews … with kids in tow … a light bulb went on. Tröegs needed food in a big way. The question was, what to serve? When he first walked into Tröegs five years back, Chef Christian DeLutis didn’t come from the beer world. The Hershey-area native had made a name for himself over a dozen years in cocktail-centric Baltimore, ultimately landing four stars as executive chef at Alizee. As with many creatives, DeLutis eventually reached a crossroads and headed home to re-center. The idea was to figure out his next move, with options from Philly to Montreal on the table. So he was as surprised as anyone when the path opened up in his own backyard. “I went from tuxedo servers, with the food going to the table all at once under a silver cloche, to the Snack Bar,” DeLutis jokes. But when the opportunity with Tröegs arose, he was all in. At the time, he was already focused on expanding his beer palate. He liked a good brew as much as the rest of us, sure—mostly of the Belgian or Miller High Life variety. “It was definitely kitchen drinking,” he quips of his Baltimore, where beer and food pairing wasn’t yet a focus. Tröegs would offer just the creative challenge he was seeking. There was just one wrinkle. The brewery had no kitchen. What they did have was a strong concept. Mining childhood memories, John and Chris Trogner had landed on the idea of a grown-up Snack Bar. “I love connecting taste, experience, and memories,” Trogner says. The space has grown with the chef. “We started small with a few items and then as we evolved and developed, we kept building on the kitchen,” Trogner says. He’s justifiably proud. DeLutis’ menu is approachable, yet elevated, eschewing pretense. And the seasonal flavors revolve tightly around Tröegs beer. “I’ve never been so challenged and happy cooking,” DeLutis says. You need only to look at his menu for proof. Butternut squash pierogies are paired with pulled pheasant, Brussels sprouts hash, and date vinaigrette. (Pair that with a nitro stout.) Pork belly comes on a sticky pretzel bun filled with mustard and kraut. Lamb-and-rice hand pies are dressed with harissa barbecue sauce. “We have all types who come in, so we like to have food for all types,” DeLutis says. Since those early sandwich days, the kitchen has expanded to include 20 cooks. To keep them in sync, DeLutis started creating seasonal pantry lists. They included ingredients, of course: grains, veggies, spices and the like. But they also featured something less traditional: references to the feelings evoked throughout the year. Winter is nostalgia. Spring is nimble. Summer focuses on fun and then fall is about the harvest and winding down. It’s a visual representation of the chef’s mind at work—and it’s at the heart of the Food Notes project. “Spring comes along and here’s Christian’s pantry,” Trogner recalls. “That’s where the collaboration really started.” What DeLutis had created was the perfect way to talk about the intersection of food and beer. It was something the brewery very much needed. 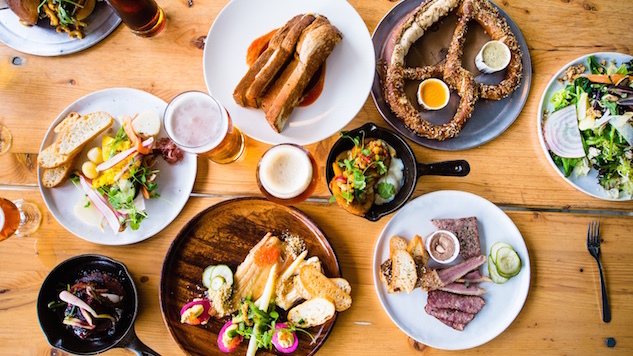 If you know anything about breweries, you know that beer dinners are critical. Not only do they build key restaurant relationships, but they’re also fun and educational for the consumer. “Twenty years into it, we’ve done so many beer dinners it’s crazy,” Trogner reflects. It proves a challenge, however, to convey each beer’s pairing potential to partner chefs. First of all, beer is highly variable from a flavor perspective, even from one IPA to the next. (Thus that warning against pairing Perpetual IPA and cabbage, which pushes the hops over the edge.) More importantly, chefs don’t take kindly to being told what to cook. “Chefs bring a wide range in ability, a wide range in creativity. All have different approaches and different things available to them,” Trogner says. He loves it, because every dinner is different. Still, it can be a logistical headache. After a call with a New York restaurant partner resulted in fireworks, one too many cooks on the line, Trogner and DeLutis knew they needed a better way. “Gears were turning. We were like, how do we tell a chef what to do or not do … without telling them what to do,” Trogner says. As it turned out, DeLutis already had the solution cooking, and it drew on the same source as his pantry lists. “At the time, we were putting out a lot of beers, and I was taking notes,” DeLutis says. His approach was simple and intuitive: he’d taste a brew, hone in on its notes, and map out flavors that might work in the Snack Bar. “They were cooking tools,” he explains. One day he showed the notes to John, and the rest is history. They took the list, pared it down, layered in gorgeous artwork by by Rachael Miller, and started distributing it to beer-dinner partners. Smart and structured, each Food Note includes the beer’s profile; a list of contrasting, complementary and adverse flavors; and (win!) no recipes. It’s a literal way of getting everyone on the same page. What Tröegs didn’t expect, however, was how much their customers would take to it. During a February visit, Trogner and DeLutis walk me through a pairing with Troegenator, their spin on a double bock. In short order, the wisdom of the approach grows clear. Everything starts with the beer—in this case, one deeply malty and fragrant with caramel and bourbon sweet mash. From there, its time for the food. We taste a salted caramel, which highlights a prune/grape flavor that Trogner attributes to the yeast. It’s a lovely complement. Salt evokes the hops. Butter coats the tongue like the Munich and Vienna malts in the beer. DeLutis’ house sausage, with offal notes and pops of tannic mustard seed, serves as a clever contrast in the form of smoke and gaminess. “Smokiness is going to accent the caramel note,” DeLutis explains. It also dials down the hops, amplifying the beer’s natural caramel notes. At the same time, the alcohol cuts against the richness of the sausage. It’s a perfect example of how Food Notes unlock the Tröegs flavor universe, in the glass and on the plate. That helps chefs planning beer dinners. It unlocks the Snack Bar menu for Tröegs guests. And ultimately, it becomes a resource for anyone pairing beer and food—so much so that Food Notes art prints are now for sale in the Tröegs gift shop. “You can create a really cool experience at home,” Trogner says. His advice: don’t overthink things and be willing to communicate your observations without fear of being “wrong.” Above all, pairing food and beer should be fun. As for what to cook? “Maybe one time you do all complementary flavors,” DeLutis says. “Maybe one time you do all contrasting. Maybe one time you just do things that won’t go with the beer, just for fun.” Match it with three-ounce pours, and engage your sense of play. That’s the power of Food Notes. Jenn Hall writes about food and culture from a Jersey-side suburb of Philly. Follow along at jennhallwrites.com and on Instagram & Twitter @jennsarahhall.